Diane Snelling | The Vermont Political Observer. Suddenly there’s one less Republican in the State Senate. Sen. Diane Snelling announced Tuesday her resignation from the Senate to take a key state environmental job. … Snelling… will be taking the job as chair of the Natural Resources Board, which oversees the regional commissions that rule on Act 250 development applications. Gov. Shumlin chose former State Senator Helen Riehle to serve the rest of Snelling’s term. Riehle will not seek a full term in November. Snelling has been in the Senate for 14 years. She’d been noncommittal on the subject of running for re-election, so maybe this move shouldn’t be a surprise. And chairing the Natural Resources Board is a prestigious job in line with her interests, but her departure is bad news for her party. Snelling has been the only Republican in the six-member Chittenden County delegation; she has consistently won re-election in that liberal hotbed, while every other Republican has badly trailed the field. Republicans’ chances of retaining her seat? We’re talking snowballs in Hell. This entry was posted in 2016 election, Vermont Republican Party, Vermont State Senate and tagged David Zuckerman, Denise Smith, Diane Snelling, Helen Riehle, Norm McAllister, Sara Kittell, Vermont Natural Resources Board on March 29, 2016 by John S. Walters. House Bill 40, also known as the RESET bill, made it through the Senate Natural Resources Committee friday. Unscathed, for the most part. RESET, for those just joining us, is the overhaul of Vermont’s renewable energy policy. It has already been adopted by the House. It’s got a lot of good stuff in it. For the most part, it’s been making good progress in a low-key way; with so many other Big Things on this year’s agenda, RESET has attracted little attention. Which I suspect is exactly how its supporters want it. It has drawn some fire from the anti-renewables crowd, who want to change the siting-approval process in ways that would make it much harder to build renewables. From their point of view, that’s a good thing. My top priority is climate change, so I think it’d be a bad thing. Mostly. 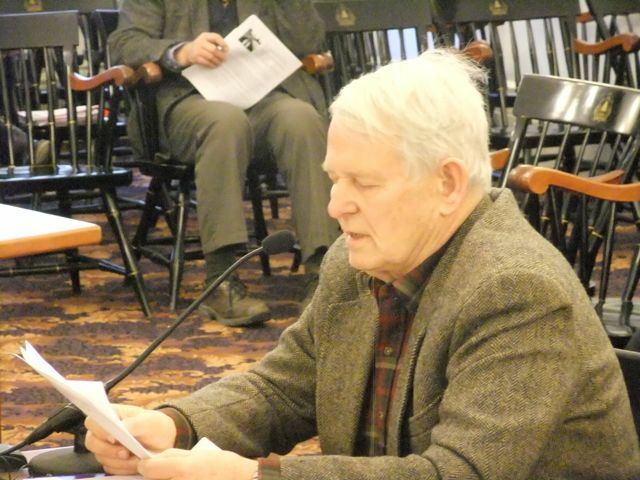 The one and only anti-renewables member of the Senate Natural Resources Committee is John Rodgers, putative Democrat from the Northeast Kingdom. Generally, the Senator is very pro-business and development (he’s a cheerleader for the Bill Stenger EB-5 project), but he’s a staunch opponent of ridgeline wind who’s branching out into anti-solar as well. Rodgers was the wild card in SNRE’s consideration of H.40. He was clearly in the minority, but he’s a persistent cuss, and he brought some amendments with him to Friday morning’s hearing. This entry was posted in Energy and tagged Chris Bray, Diane Snelling, H.40, John Rodgers, Mark McDonald, RESET bill, Senate Natural Resources and Energy Committee, siting and setback on April 25, 2015 by John S. Walters. The Senate Natural Resources and Energy Committee heard testimony from four experts plus John McClaughry. The latter cast plenty of aspersions and did his best to sprinkle a pinch of doubt into the overwhelming scientific consensus that climate change is real and that We Humans are contributing to it. *Since when does John McClaughry not believe in profit??? Gee, John, don’t hold back. It’s bad for your blood pressure. As for the experts, Dr. Gillian Galford of UVM’s Gund Institute reported that 97% of the scientific literature agrees that “climate change is happening and is due to human actions.” She walked through several charts that showed the facts of climate change from the global level (everywhere on the planet EXCEPT the northeastern U.S. had an unusually warm winter) to the local (Joe’s Pond ice-outs are happening later and later). Which might not float your boat, but it’s a valuable perspective to hear. The other witnesses were environmental activist and UVM freshman Gina Fiorile, and the puppet master himself, Paul Burns of VPIRG. After the hearing, the committee spent about 45 minutes tossing the resolution around like a rag doll. Most of the objections came from Sworn Enemy Of Wind Power John Rodgers and wind skeptic Diane Snelling. Frankly, my sense is that both of them don’t want to vote “yes” on the bill, but don’t want to vote “no” either. Snelling offered a vaguely-couched but insistent objection to a clause acknowledging that Vermont has fallen short of its carbon reduction goals. Which, of course, it has. Well, to be precise, our carbon production increased during the Nineties and early Aughts and then declined. We’re now roughly where we were in 1990. Which is nice, but our statutory goal was a 25% reduction. Oh well, another statute ignored. Rodgers wants energy projects to be subject to Act 250 — and more. He wants them sited “as near the end-users as can be.” Gee, I wonder how he feels about the massive energy imports we make from Hydro Quebec, currently our primary source of “renewable” energy — and about the likelihood that more transmission lines will be built if we don’t develop our own renewable sources. 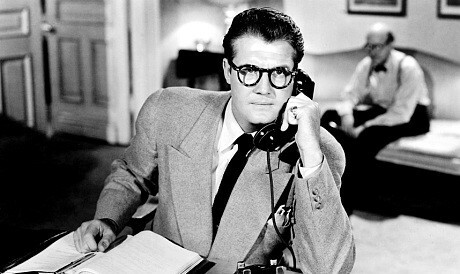 Anyway, I’m not arguing that John Rodgers makes sense. I’m just reporting that he won’t support a nonbinding resolution unless it includes language about siting reform and a reliance on “Vermont-scale projects” or something like that. What struck me is that very few sensible Vermonters are willing to overtly deny climate change. Almost everyone (except John McClaughry) will acknowledge that it’s a problem we need to address — but then they throw obstacles in the way. We don’t want to increase costs, we don’t want to imperil any unspoiled spaces or view sheds. We can’t do anything that’s not in the vaguely-defined Vermont Way. We’re too small to make a difference. In the end, it boils down to this: they see other things as bigger priorities than climate change. Which means they’re not serious about climate change. Back to the resolution. Committee chair Chris Bray finally decided to table it with the intention of refining the language in time for a committee vote tomorrow (Thursday). Afterward, Campion expressed surprise that his resolution sparked so much opposition. “I thought it was a slam dunk, and it wasn’t,” he said. “I don’t know how much I’m willing to bend, to be honest with you. I’m okay with a few tweaks, but if it were to change the intent, forget it.” He’d rather have a 3-2 or 4-1 vote on something like his original resolution than a unanimous vote for a watered-down version. What’s been interesting [about serving on Natural Resources] is how much I’ve learned that we as Vermonters are not doing. We pat ourselves on the back, beause we do some amazing things. But when you look at not meeting our carbon reduction goals, you look at Lake Champlain and other bodies of water, we still have a lot to do. We have a lot to accomplish, and we’ve got to be very serious and focused on it. This entry was posted in Energy issues, Environment and tagged Brian Campion, Chris Bray, climate change, Diane Snelling, John McClaughry, John Rodgers, Senate Natural Resources Commitee on March 25, 2015 by John S. Walters. The Vermont Democrats know what they’re doing. Well, that’s not news. But when you look closely at scheduled activities for the last full week before Election Day, you realize how narrowly they’re targeting a handful of key races. And using their big guns to do so. Is Bernie standing on a box? First, there was the weekend-long victory tour, headlined by Gov. 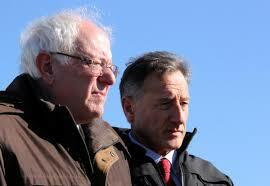 Shumlin and Sen. Bernie Sanders, and also featuring Dean Corren. They stopped in Bristol, Proctor, Hinesburg, and St.Albans. Which, at first glance, might make you wonder why not Montpelier or Burlington. Well, because they don’t need the votes there. Bristol is the home district of two powerful state representatives: David Sharpe, ranking Democrat on the House Ways and Means Committee, and Mike Fisher, chair of the Health Care Committee, which is kind of important to the Governor’s single-payer agenda. Sharpe and Fisher face a well-funded Republican with a very familiar name: Valerie Mullin. I don’t know if she’s related to Sen. Kevin Mullin, but a popular name is a significant advantage for a political newbie. And the Republicans are hoping she can knock out Fisher or Sharpe. Then comes Proctor, in Rutland County — one of the key State Senate battlegrounds. Republicans are hoping that Brian Collamore can knock off appointed incumbent Eldred French and give the GOP all three Rutland County Senate seats. Democrats are hoping they can save French and get William Tracy Carris into the Senate. Or at least hold onto a seat, preventing a Republican pickup. The third stop was in Hinesburg, which doesn’t seem like a terribly high priority. The town’s two House seats are safely Democratic. Hinesburg is part of the Chittenden County district in the Senate, with five Democratic incumbents and one Republican. The 5-1 split is likely to remain intact, although Democrat Dawn Ellis has run a spirited campaign, and Republican Joy Limoge has raised quite a bit of money. I don’t think the Dems are too worried about Limoge, but maybe they see an opening to knock off Republican Diane Snelling. Or maybe they just wanted to hold one rally within easy driving distance of the Burlington-based TV stations. The final rally was in St. Albans, perhaps the most hotly contested community in all of Vermont. There are two Democratic incumbents in the House, Kathie Keenan and Mike McCarthy. The Republicans hope to win at least one of the seats. And, of course, St. Albans is the population center of the Franklin County contest for two Senate seats, currently split between the parties. Republicans hope to grab both seats in November, while the Dems want to hold their ground or possibly even take both. The point about Democratic targeting is reinforced by Gov. Shumlin’s schedule for this week. He walked in the Rutland Halloween parade Saturday night; on Monday he’s holding a press conference in Rutland and speaking to the local Rotary Club. And on Thursday, he’s holding a press conference in St. Albans. Near the end of the week, he’s giving a pair of high-profile speeches in Burlington that should draw TV coverage: the annual meeting of the Vermont Economic Development Agency on Friday, and a fundraiser for Vermont Parks Forever on Saturday. The Republicans, by contrast, seem to be completely uncoordinated. Not that they have anyone with the drawing power of Shumlin or (especially) Sanders; the closest thing they have to a political celebrity is Phil Scott. Not really in the same league, especially as an inspirational speaker. And I haven’t seen any signs of any real coordination among Republicans. You’d think that Phil Scott, as the party’s top officeholder and most popular active figure, AND as the guy who wants to make the party more inclusive, would be actively engaged in some party-building and promotion of legislative candidates. Maybe he has been; if so, it hasn’t exactly been high profile. In any case, the main point is this: the Democrats are doing exactly what they should be doing in the final days of the campaign. This entry was posted in 2014 election, Bernie Sanders, Dean Corren, Peter Shumlin, Phil Scott, Vermont Democratic Party and tagged David Sharpe, Dawn Ellis, Diane Snelling, Kathie Keenan, Mike Fisher, Mike McCarthy, Rutland, St. Albans on October 27, 2014 by John S. Walters.